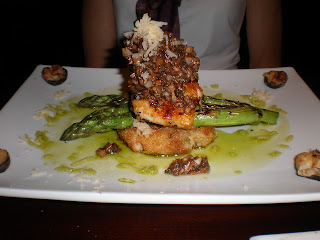 I had been looking forward to visiting 1618 Seafood Grille since they swept the “Fire in the Triad” Dining Competition. Additional glowing recommendations from just about everyone I've spoken to in Greensboro established it as the venue for my mother’s birthday dinner. I had been studying the menu for weeks, knowing that it changed frequently, but still salivating from each description. The menu reads like a delicious novel. 1618 is one of the best dining experiences I’ve had in North Carolina. After sampling a few tapas at 1618 Wine Lounge (the fried frog legs are noteworthy), I was ready for the big guns. 1618 Seafood Grille is located on Friendly Avenue, tucked away just a mile or so down from Friendly Shopping Center. Cinderblock walls are adorned with stark yet quirky art. The charming manager, Nick Broome, also happened to be our server. 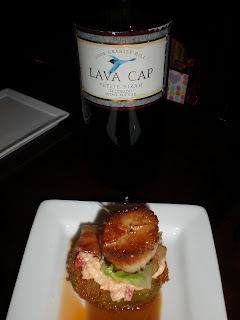 He kindly offered us three samples from their extensive wine list, and we settled on a Lava Cap Petite Sirah. Rosemary bread is served with pesto, which boasts earthy notes (and more is delivered if requested.) Pan Seared Sea Scallops rest atop a Crispy Fried Green Tomato, Pimento Cheese, Romaine Lettuce and Bacon. The trio of sauces that accompany this have an unbelievable depth of flavor – Creamed Corn Sauce, Demi Glace and Chipotle Oil highlight different notes of the dish. I noticed cracked black pepper in the Fried Green Tomato batter – incredible attention to detail. Though there is a note at the bottom of the menu that says dishes will be delivered to the table as they are ready, all of our entrees were served promptly, at the same time. The concept behind each of Chef George Neal's dishes blows me away. I would have never imagined putting some of these ingredients together, but I am so thankful he did. 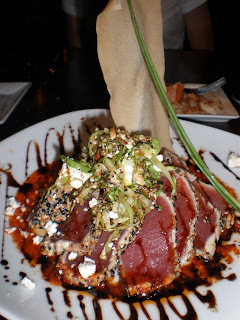 Detailed descriptions of the menu helped me land on the Sesame Seed Encrusted Ahi Tuna - a dish I will dream about for years. A fried wonton wrapper appears to be a sail (whimsical), and seared tuna lays on a cloud of Wasabi Mashed Potatoes, topped with Sautéed Cabbage, Toasted Almonds, and, wait for it – Feta Cheese. I was skeptical of this combination, but the slightly sweet Balsamic Glaze and spicy Chipotle Oil allow all the flavors to come together and echo one another. It is flawless. These photos don’t come close to giving the works of art Chef Neal presents on his plates justice. My description of this dish doesn’t even do it justice, but I’ll try. 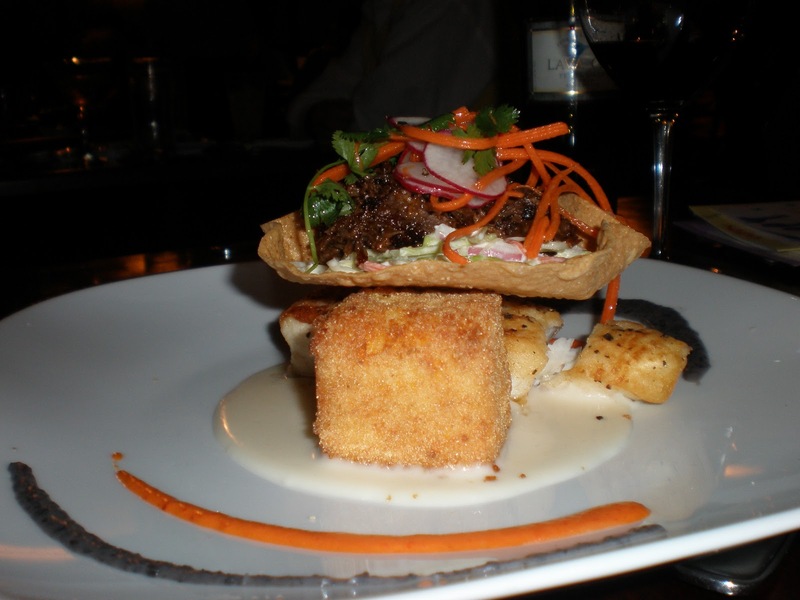 Pan Seared Alaskan Halibut is cooked perfectly, sitting on a Manchego Grit Cake, and topped with a taco salad: a tortilla bowl filled with Korean Short Ribs, Wasabi Slaw, Radish and Carrots. This is essentially two meals in one, but oddly enough, they work perfectly together. Both dishes are enhanced by a trio of sauces: Red Pepper Coulis, Black Bean Puree and Queso Sauce. Like I said, the menu reads like a novel. 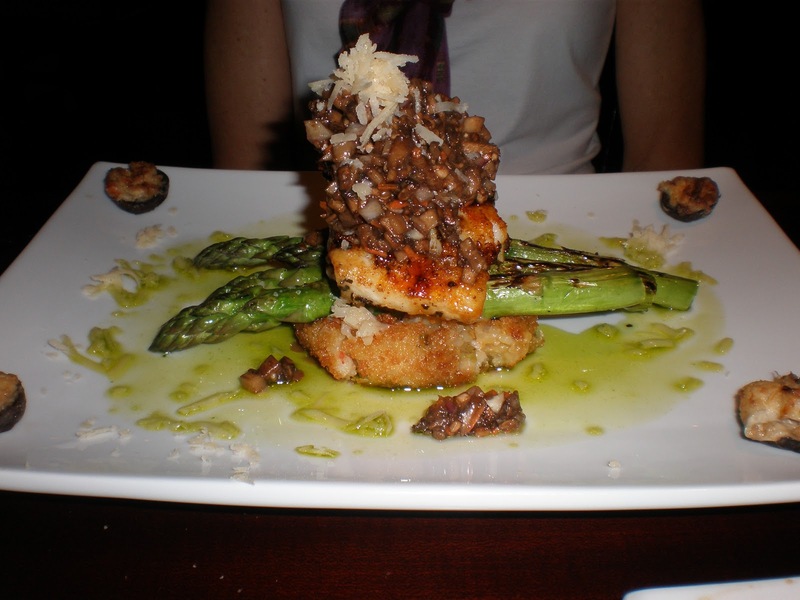 Grilled Chilean Sea Bass rests between a Shrimp Havarti Risotto Cake – an inventive play on shrimp and grits – and a succulent, vinegary Portabella Mushroom Relish. The delicious saltiness of the relish lingered on my taste buds. The plate is adorned with crab and artichoke-stuffed mushrooms, where a hint of lemon is present. Large asparagus brings some color to the plate and is nicely al dente. After notifying Nick of the birthday girl at the table, she was surprised with a scrumptious chocolate cake, layered with vanilla buttercream and chocolate fudge, with two ripe strawberries and a candle. The perfect ending to an exceptional meal. I couldn't have been more impressed with 1618. The restaurant boasts one of the most inventive menus I've ever seen, and offers some of the best service I've ever received. Nick's thoughtful attentiveness to our party made us feel welcome, and no one was intimidated by the menu. Chef Neal is very aware of how to pair obscure flavors and create a masterpiece, pleasing both the eye and the palate. 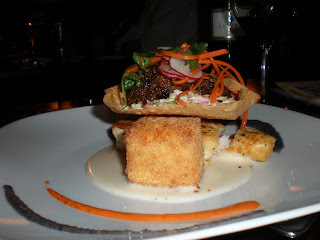 My experience cements 1618 as one of the top restaurants in the Piedmont Triad, and North Carolina. I will be rooting for Chef Neal and the 1618 crew next month at the Final Fire event. I know they will blow the competition out of the water.